Nikki Walker and Lizan Mitchel in Dead and Breathing. Photo by Christine Jean Chambers. BOTTOM LINE: A play that aims for moral discussions, expands towards trans rights and circles back to Christian faith and self-acceptance. Carolyn (Lizan Mitchel), a wealthy lady in her sixties, has outlived her cancer and now contemplates committing suicide. Veronika (Nikki Walker), a forty-something-year-old nurse, is assigned to take care of Carolyn. Unlike the previous nurses that either got tired of Carolyn's sharp wit, relentless tongue and embittered demeanor, Veronika, in her optimistic, faith in God, and life-loving ways, sticks to her task like an ant to molasses. Unphased by Carolyn's hard words, she stands her ground and presents the match Carolyn has been wanting. Impressed by that, Carolyn attempts to win Veronika over so that she'll assist her in her suicide. Veronika, like a formidable opponent, engages in a high intensity and high volume tug-of-war that moves the entire story. The evening begins on a silent note with Mitchel's character soaking on her tub, being given a bath. The contrast between hers and Walker's mouthy, loud and bright character is telling and well built. Emanating power, Mitchel gets out of the bathtub and wrapped in a towel gives us a character that is bigger than life. A feat that is carried throughout the evening, a Norma Desmond with edge, if you will. Walker delivers a compassionate and strong character that uses her good and constant mood to convince herself and others that life is more than just the pain and hardships we face. A two character play, Dead and Breathing finds its core in the struggle between a pragmatic understanding of life and life as a gift that needs to be cherished and preserved in spite of itself. But it is also more than that. Carrying a twist that when revealed seems to take the entire play off its course, Dead and Breathing takes a stand towards awakening us to the plights and struggles of the transgender people and their displacement in society in all levels—personal, social, professional and emotional. Although the moment of revelation is powerful and although it raises the dramatic tension even more between the two characters, it seems out of tone within the context of the play. The humor, and here is the only moment where I questioned the taste, is the way used to bring us back into the tug-of-war between both women. Nonetheless, this piece presents victories worthy of applause. 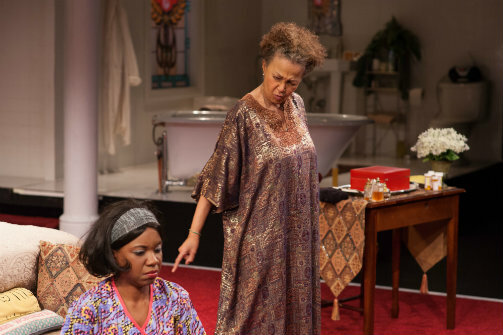 It puts black women on stage and expands the horizons on character representation; it presents transgender identity without banking on the propaganda of identity; and it explores the comedy in the absurdity of human life. Chisa Hutchinson is a talented playwright who balances what may be considered vulgar language with a raw poetry and a debate of substance that, even if heavy handed towards the end of the play, raises valid questions about the placement of power in society and its relation with race, morality, and relying on faith in order to make life bearable. Dead and Breathing adds to the tradition of great shows produced by The National Black Theatre and presents a fine alternative to the jaded shows about the black experience that attempt to talk about life but ultimately get caught up in the propaganda of it. With a lush set by Maruti Evans that sets the mood from the get-go and projects onto the audience the opulence of Carolyn's wealth, lighting design by Alan Edwards that punctuates the storytelling, elegant costumes by Karen Perry, and sparse but essential sound by Justin Hicks, the artistry present within this piece is professional and shows intention. And what more can we ask of a theatre and their artists if not to be stirred, touched, and intentionally left with powerful thoughts to ponder. Dead and Breathing is written by Chisa Hutchinson and directed by Jonathan McCrory. Scenic design is by Maruti Evans. Lighting design is by Alan Edwards. Costume design is by Karen Perry. Sound design is by Justin Hicks. Special effects are by Valerie Gladstone. Halle Morse is the stage manager, Belynda Hardin is the production manager, and Ngozi Anyanwu is the production assistant. The cast includes Lizan Mitchell and Nikki Walker.